Here is a small guide about Samara, a beautiful area located on the southern Pacific coast of the Nicoya Peninsula, Guanacaste. It is a small town with sunny beaches of white sand and shallow clear waters and soft dreamlike landscapes. It is considered one of the safest beaches in Costa Rica, making it an ideal place for your vacation. It is the perfect place to sunbathe and have a good time at the beach. Samara is a very relaxed small town that lies in a large bay with a wide beach about 4 km in length, outlined by palm trees. It is a suitable beach for water sports. Samara has an excellent coral reef and its own wooded island in the bay, the Chora island. This area is very popular for swimmers and surfers. Samara is a mix of coastal nature and all the necessary facilities of a resort, among which are a range of shops, supermarkets, tour operators, hotels, an art gallery with its own resident artist, restaurants from Costa Rican cuisine to international restaurants and bars. You can also find surf and Spanish schools, but unlike other resorts of the Pacific Ocean, it is also a community of fishermen and farmers. This area has lots of Tico cuisine, and is very popular among Costa Rican tourists for its easy access. Samara also offers a good range of accommodations, from cheap rooms and cabins to luxury hotels. You can also admire the exotic fruit crops and organic farming in nurseries and reforestation projects, which are authentic and vital Samara activities. Samara offers beautiful sunsets typical of the Guanacaste area, and at night enjoy bars, restaurants and nightclubs located around the town. There are several ways to reach this area, you must choose the one that best suits your needs. This town is located about four hours from San José, or two-hour drive from Liberia, Daniel Oduber International Airport. If you choose to travel in shuttle service, Interbus offers the best option in shared service around the main tourist destinations in Costa Rica, this service is recommended for people who do not want to drive along unknown paths and want a secure comfortable transportation. For more information about the routes from /to Samara, please write to Info@interbusonline.com or access the following link to Interbus Routes . To book Click Here . Remember to book your ticket in advance. You can also take a local flight from San Jose to Samara. The companies responsible for providing these local flights are Sansa and Nature Air; these flights arrive at the airport in Nosara. Nosara is located about 20 minutes north of Samara. In Nosara you should take a taxi or a local transportation. By public transportation service from San Jose to Samara, the company responsible is Empresas Alfaro, this bus station is located in San José, 14th Street and 5th Avenue. They offer different departure times. If you visit Costa Rica do not hesitate to spend a few days in Samara. There are many activities you can do during your stay in Samara; hotels and tour operators in Samara can arrange your days activities. Sport fishing is a popular activity in the area; together with the snorkeling and diving, you can find great coral environments in this area, very close to the coast. The best place for diving is in Cangrejal, at the northern end of the coast where the coral reef arrives to the beach, and during dry season you can enjoy crystal clear waters with colourful fish, stingrays, and starfish. You can also take bird watching tours by boat or kayak. In front of to the coast in Chora island, you will find a variety of sea birds. This is the perfect place for lovers of these species. Here you will enjoy a beautiful pink sand beach. You can also go kayaking to the Río Ora estuary or Buenavista. You can practice SUP, a popular sport where you paddle standing on a surfboard. Since it is a very calm beach, this beach is perfect for beginner swimming and surfing. However, if you need more challenging waves for experimental surfers you must to go 12 km south of Samara in Playa Camaronal, there you will find an attractive beach for this practice. On the contrary, if you want to spend more time in the coast or in the mountains, you can choose to take a horseback riding tour, canopy tour, rent an ATV or a bike, and reach nearby beaches. 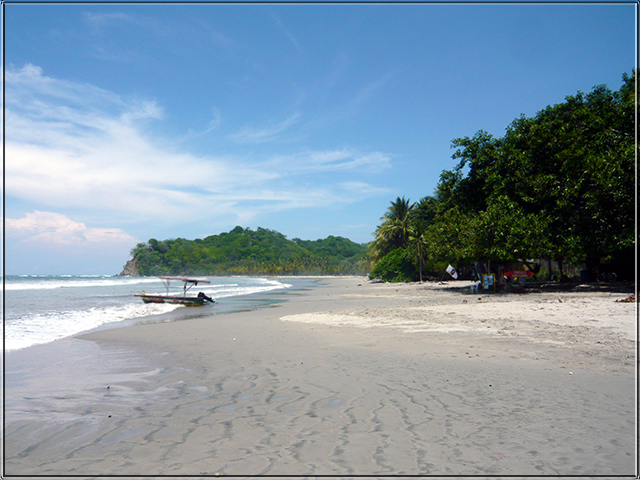 To the north is the wide deserted Buenavista beach, and in the south get to Puerto Carrillo.